Tunisians have been staging the first protests of the Arab world against the crown prince, denouncing him as a murderer involved in the killing of Jamal Khashoggi. 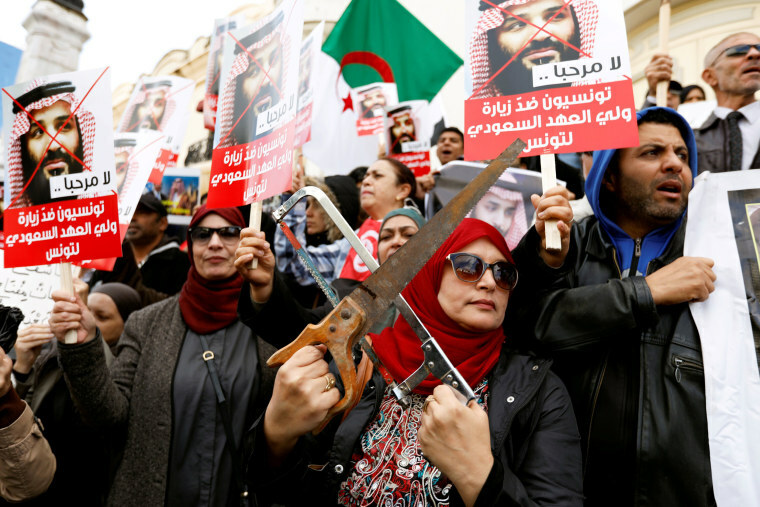 TUNIS — Hundreds of Tunisians staged the first protests of the Arab world against Saudi Arabia's crown prince as he arrived on a visit on Tuesday, denouncing him as a murderer involved in the killing of Saudi journalist Jamal Khashoggi. The protests were a rare occurrence for Crown Prince Mohammed bin Salman, the kingdom's de facto ruler who faces no overt criticism at home and who received lavish receptions earlier in his tour in visits to Bahrain, the United Arab Emirates and Egypt. Since the 2011 "Arab Spring" uprising, which unseated several entrenched rulers in the region and triggered turmoil, Tunisia has undergone a democratic transition and is one of the few Arab countries to allow protests. Prince Mohammed was welcomed by Tunisian President Beji Caid Essebsi on arrival at Tunis airport, the presidency said, and the two went into talks shortly afterwards at Carthage Palace. The crown prince told Tunisian state television that Saudi Arabia has long had good relations with Tunisia, adding, "I cannot come to North Africa without visiting Tunisia...Tunisia's president is like my father." A Tunisian presidency statement issued later said Prince Mohammed and Essebsi reviewed ways to improve cooperation on the "economy and finance, investment promotion and security and military cooperation to counter extremism and terrorism". The mood in the streets was less friendly. In a second day of demonstrations against Prince Mohammed, hundreds of protesters marched along central Habib Bourguiba avenue in Tunis, scene of the mass protests that toppled autocratic president Zine El Abidine Ben Ali in 2011. They chanted "the murderer is not welcome in Tunisia" and "shame on Tunisia's rulers" for receiving the crown prince. The killing of Khashoggi, a Washington Post columnist and a critic of the crown prince, at Riyadh's consulate in Istanbul on Oct. 2 has frayed Saudi Arabia's relations with the West and tarnished Prince Mohammed's image abroad. Saudi Arabia has said the prince, heir to the throne of the world's top oil exporter, had no prior knowledge of the murder. Protesters raised a large poster which depicted the Tunisian president pouring water on the bloodied hands of the Saudi crown prince - suggesting Tunisian complicity in washing away guilt. Protesters also called for an end to the Saudi-led military campaign in neighboring Yemen, which was launched by Prince Mohammed in his role as defense minister in 2015. The protests were in sharp contrast with earlier parts of the crown prince's tour of allied countries in the region. Egyptian President Abdel Fattah al-Sisi underlined the strength of Cairo's ties with Riyadh and called Saudi Arabia's security and stability "an inseparable part of Egypt's national security." Tunisian journalists on Monday put up a huge banner at their union showing the prince with a chainsaw, which Turkish sources have said was used to dismember Khashoggi in Istanbul. It read: "No to the pollution of the Tunisian revolution." In an apparent attempt to avoid embarrassing the prince, the presidency only invited photographers to cover his visit. It will not hold a news conference, a usual event at top visits. Last week Essebsi adviser Nourredine Ben Ticha said the truth about the killing of Khashoggi must be established but the incident should not be used to harm the kingdom's stability. Tunisia and Saudi Arabia have very different political systems. The kingdom is an absolute monarchy while Tunisia has been holding free elections since 2011 and agreed three years later on a constitution guaranteeing fundamental rights. Tunisia was a strong Saudi ally under Ben Ali but ties have since been strained at times. The kingdom granted exile to Ben Ali after he flew to Jeddah on the Red Sea following his ouster, resisting calls by some Tunisian parties to hand him over. Another irritant is that moderate Islamists have been sharing power with secularists in Tunisia since 2011. Some critics have likened the Tunisian Ennahda party to the Muslim Brotherhood, which is banned in Saudi Arabia. In contrast, Tunisia has since 2011 expanded cooperation with Qatar, with which Saudi Arabia and three other Arab states severed trade and transport ties in June 2017. The four accused Doha of supporting terrorism and Iran — charges Doha denies. Tunisia also has strong ties with Turkey, whose relations with Saudi Arabia have been strained by the Khashoggi killing. The crown prince is expected to fly on to a G20 summit in Argentina at the end of his Tunisia visit.